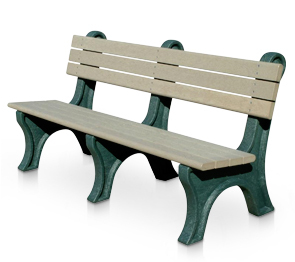 The Classic recycled plastic benches feature rounded edges for safety and comfort and ball top bench ends to match. Designed with a wide seat and full back support. These benches excel in comfort, appearance, and durability. UV Protectant colorant molded throughout the plastic to resist fading. Moisture resistant, insect resistant, will not corrode, rot or splinter and best of all, no painting or sealing is necessary. Surface cuts or scratches can simply be ironed away. Available in 6' and 8' lengths. Constructed of seven 2" x 4" recycled plastic planks with rounded bullnose edge outer planks and sturdy ball top recycled plastic bases. All stainless steel fasteners are included. 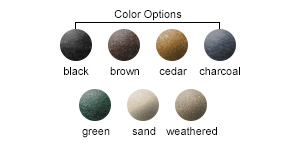 Recycled plastic color options shown below.